Lineage. Designated as 151st Fighter Group (Air Defense) and allotted to the Utah ANG and extended federal recognition and activated on 24 Aug 1957. Redesignated: 151st Air Transport Group, Heavy on 1 Apr 1961; 151st Military Airlift Group on 1 Jan 1966; 151st Air Refueling Group on 20 Oct 1972; 151st Air Refueling Group, Heavy on 1 Apr 1978; 151st Air Refueling Group on c. 16 Mar 1992; 151st Air Refueling Wing on 1 Oct 1995-. Assignments. Utah ANG, 1 Jul 1958-. 29th Air Division, ADC, 24 Aug 1957; Western Transport Air Force, (WESTAF), ATC, 1 Apr 1961; Twenty-Second Air Force, MAC, 8 Jan 1966; Strategic Air Command, 1 Jul 1972; Air Combat Command, 1 Jun 1992; Air Mobility Command, 1 Jun 1993-. Aircraft. F-86, 1958-1961; C-97, 1961-1969; C-124, 1969-1972; KC-97, 1972-1978; KC-135, 1978-1982; KC-135, 1982-. Operations. Implemented the ADC Runway Alert Program in 1958, in which interceptors of the 191st FIS were committed to a five-minute runway alert. Provided military airlift role to worldwide mission capabilities after redesignating to 151st ATC. Flew its first mission into the Southeast Asia theater combat zone in late 1964, and continued to do so throughout the Vietnam War years. In Jan 1979, began the 24-hour-per-day Strategic Air Command (SAC) alert commitment which ended in 1991. In Apr 1983, the 191st ARS was involved in the first Pacific Tanker Task Force, with flights to Guam, South Korea and Australia. 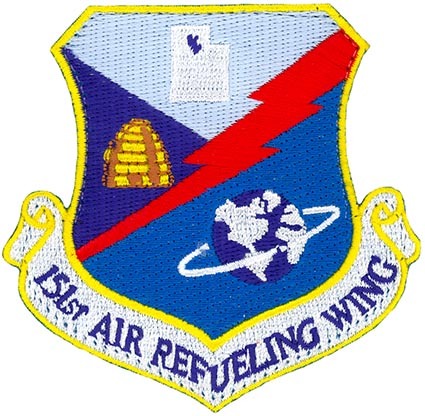 Deployed in support of Operation Desert Shield to the forward operating base at Cairo West Airport, Egypt on 27–29 Dec 1990 and became the basis for the 1706th Air Refueling Wing (Provisional).